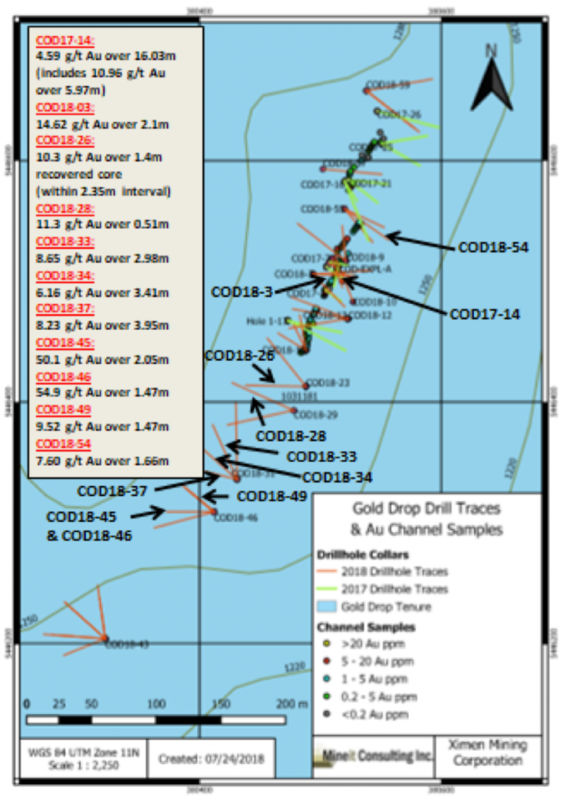 The analytical results listed below are highlights from drill holes COD18-55 to COD18-60 (intersections greater than 1 g/t gold), testing the continuation of the COD Vein in the area of the 2017 trench at the COD Vein. Since true widths cannot be accurately determined from the information available the core lengths (meters) are reported. The gold, silver and tellurium analyses are reported in grams per tonne (g/t). The samples listed in the preceding table include quartz veining (plus or minus calcite) and / or altered granodiorite. Pyrite is present in all samples, both in veining and wall rock. 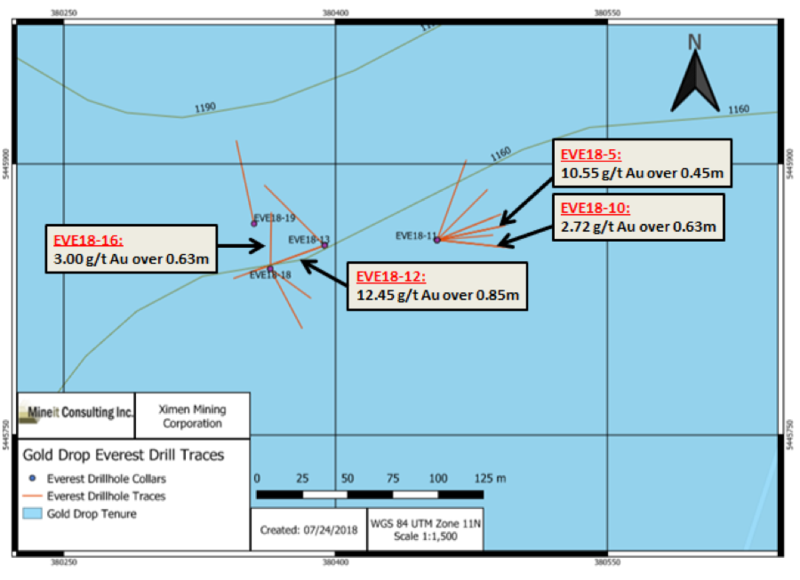 The 2018 drilling program also tested the continuation of the Everest Vein, which is located southwest of the COD Vein worksite. The Everest Vein was first discovered by Company prospectors during the 2017. Chip samples collected in 2017 across the approximate 0.4 meter wide vein exposure returned up to 52.8 g/t gold and 377 g/t silver while a grab sample of a quartz vein boulder broken off the outcrop by the excavator returned 81.8 g/t gold and 630 g/t silver (News Release of August 21, 2017). 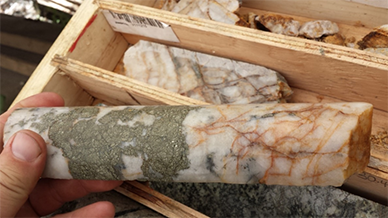 Drill core from the 2018 winter program was geologically logged and sampled. Drill core was sawn in half with half core samples submitted for analysis and remaining half core stored in a secure location. Core samples were delivered to the ALS Minerals laboratory in Vancouver to be analyzed for gold by Fire Assay – AA. Samples exceeding 100 g/t gold were re-analyzed for gold by Fire Assay – Gravimetric Finish. The samples were also analyzed for 48 Elements by Four Acid ICP-MS. Samples exceeding 100 g/t silver were re-analyzed for silver by Four Acid ICP-AES. One sample from COD18-46 exceeded 1500 g/t silver and was re-analyzed for silver by Fire Assay – Gravimetric Finish. Quality control (QC) samples were inserted at regular intervals.